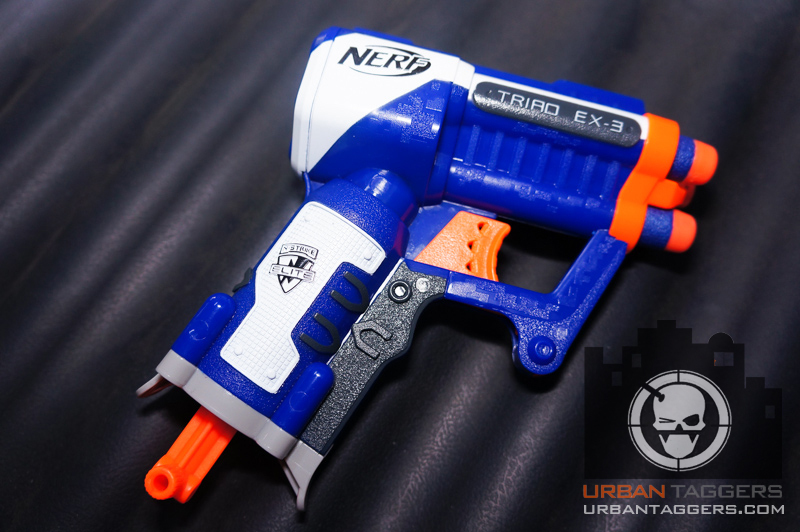 There have been a LOT of rumours about this lil' puppy since the N-Strike Elite series were announced; the priming handle of the Triad EX-3 was so similar to the existing N-Strike Jolt, that we were lead to believe it WAS the Elite version of the Jolt. 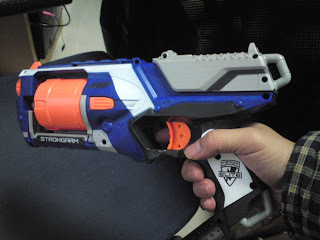 The Triad EX-3 however is somewhat bigger, and while following similar design cues, is a different blaster in itself. 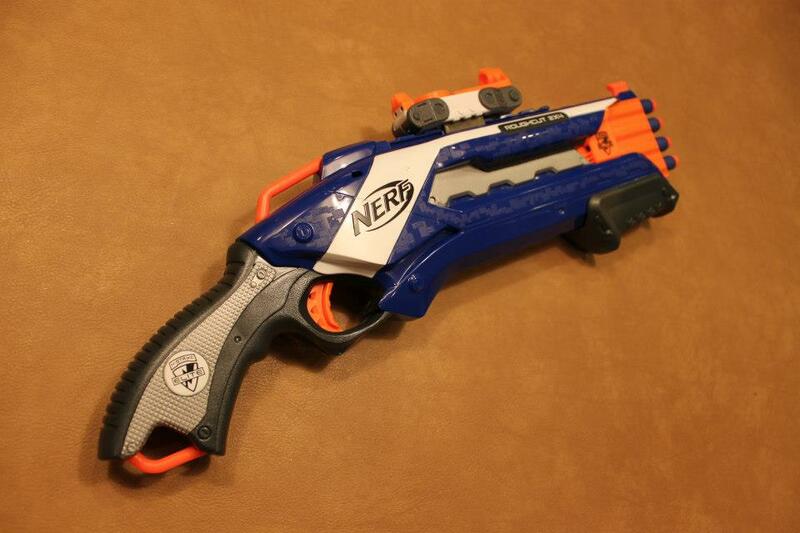 And it fires three darts. Cool! More after the jump. 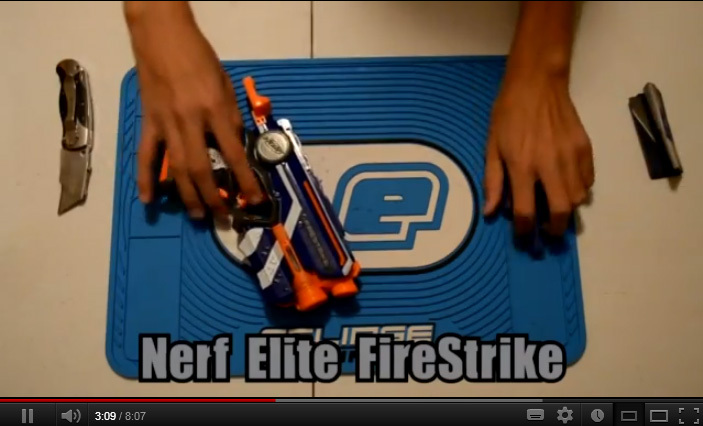 Nerf N-Strike Elite Stryfe: Impressive. Very Impressive. I've never really been certain about flywheel blasters- on one hand they are pretty noisy and obviously give away your position almost immediately (especially in an indoors sneaking-around-the-apartment kinda environment) but on the other they seem to have sort of fallen into the "SMG" class of the Nerf blaster world with their compact size but relatively powerful semi automatic firing (in the Barricade, Rayven and Stockade) which I do like as far as the 'tacticicool' tilt is concerned. Nerf have addressed both of these elements in the form of the new N-Strike Elite Stryfe and after playing with it for a week or so, I have to say it's definitely now become one of my real favourites. Here's why:) More after the jump. Just saw this today- box art for the upcoming Super Soaker Arctic Shock. 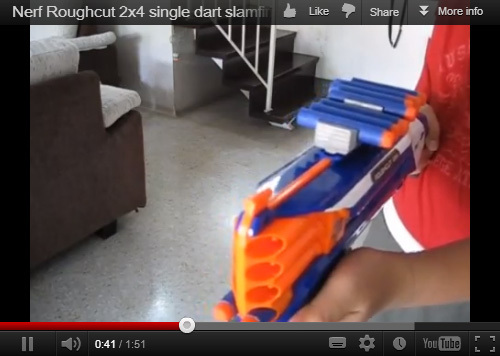 I love the aesthetics of this water gun but the issue of the lack of trigger still grates me. Ice cubes were also a novel idea but I dunno if they EVER really took off- even back in the old days of the original Arctic Shock- but at least you've got a large capacity water tank! 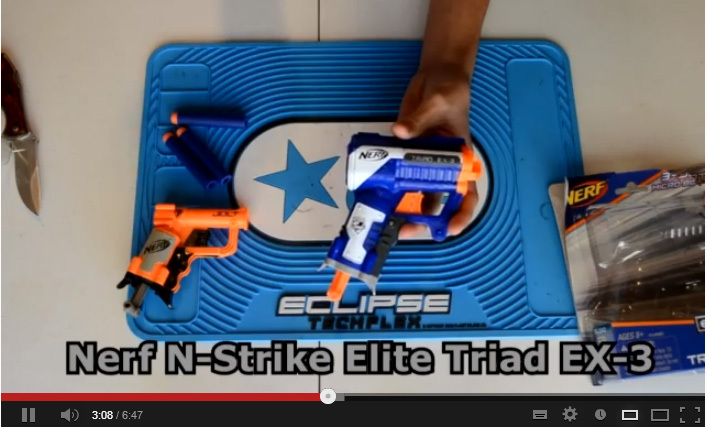 N-Strike Elite Stryfe: Power up with.. Duracell? 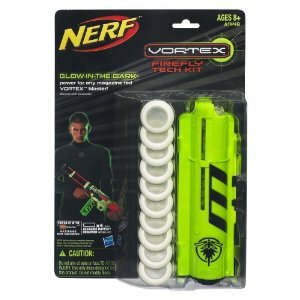 And also spotted on Amazon by Nerf2Me2 are a whole lot of Firefly clip and dart packs for your Elite and Vortex blasters. Images after the jump! 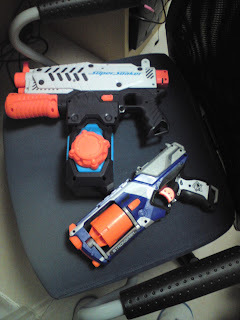 You can never accuse Nerf of just sitting on their hands and enjoying their success. 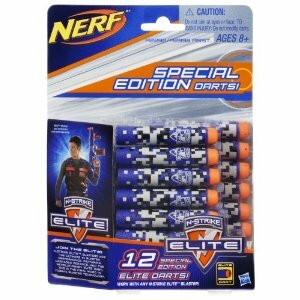 Spotted on Amazon.com, check out these mad 'special edition' digital camo N-Strike Elite darts- in blue and grey. Aesthetically schmick, in my opinion:) More pics after the jump. Cheers Dustin for the lead! Probably the first unboxing video of the new Nerf N-Strike Elite Triad EX-3 I've seen, courtesy of YouTube channel 'Nerf2Me2'. Check it out after the jump- will you get one? 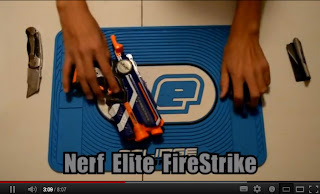 The Nerf N-Strike Elite Firestrike has been spotted around the US at various locations, and we've been sent a great unboxing video courtesy of YouTube channel Nerf2Me2. He also compares it to the Nitefinder, and subtle features that we wouldn't have known before, like the little light up bar on the side:) Video (and also another vid for the modders out there) after the jump or check it out on the channel. "It may be about a month away, but around here the countdown to 2013 has begun. 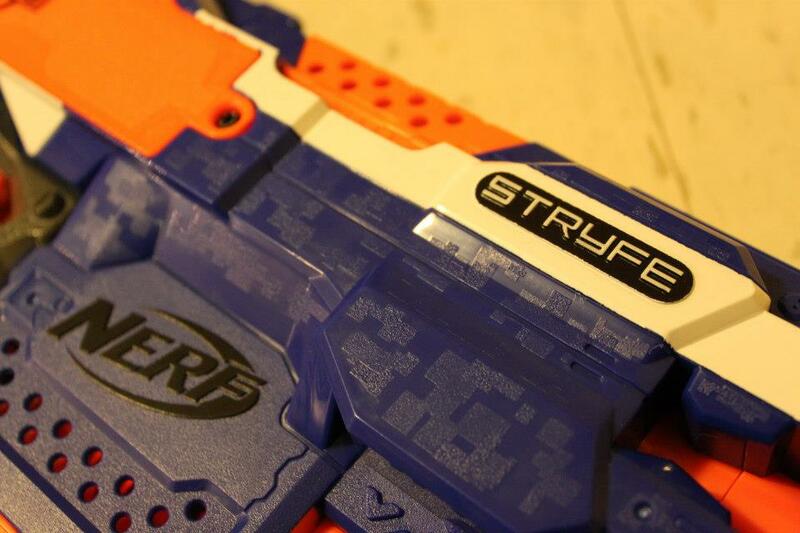 Hitting shelves around the world in 2013, the brand new N-Strike Elite Stryfe blaster and newly updated N-Strike Elite Rayven blaster will add serious power to your collection in the new year. 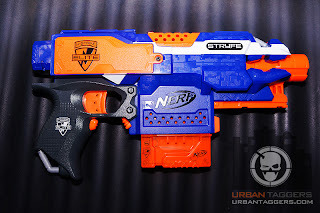 The N-Strike Elite Stryfe blasters’s semi-automatic firing action makes one-handed blasting easy while being able to unload up to 6 darts in just 3 seconds! 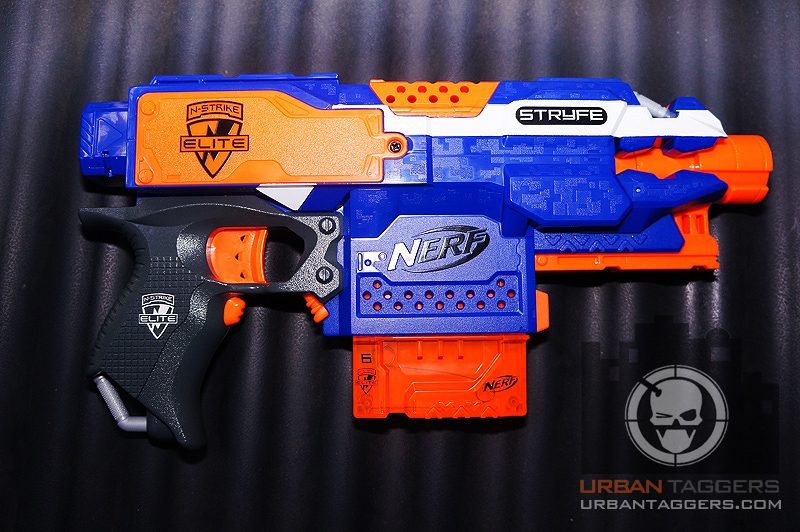 The N-Strike Elite Rayven blaster has been newly updated to feature Elite styling and long-distance performance. Like this post if you plan on adding one of these blasters to your Nerf collection next year. 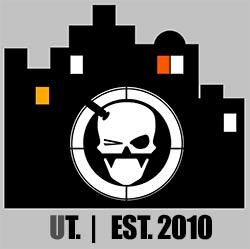 (Please note: availability and timing will vary by country/state/city)"
In any case, it's just Rough Cut eye candy:D Thanks Than for the heads up! Just a few more images sent through to me of the upcoming N-Strike Elite Strongarm - I like how it's sleeker looking than the Maverick. 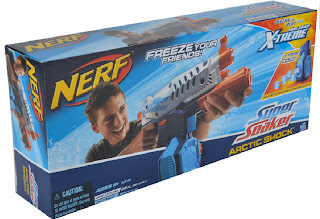 There's also an image of it next to the upcoming Super Soaker Arctic Shock- you can see the over sized clip/tank lid is to allow you to add ice cubes. 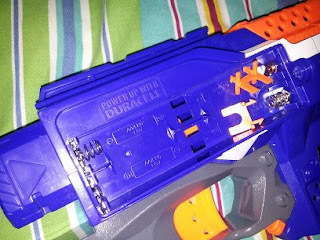 You can see there's no trigger though:( Thanks to AC again for the intel!